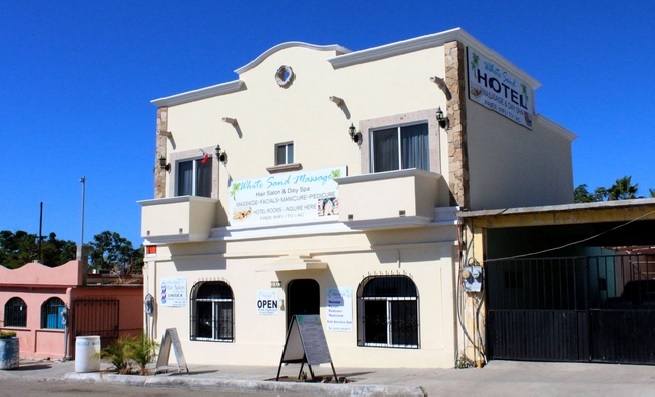 White Sand Hotel, Massage, Hair Salon, & Day Spa has a convenient location in the center of downtown Todos Santos, Baja California, Mexico. We offer the finest services in hotel accommodations, massage, hair salon, facials, manicures, pedicures, waxing, and more. Welcome to White Sand Hotel, Massage & Spa! White Sand Hotel, Massage, Hair Salon, & Day Spa has a convenient location in the center of downtown Todos Santos, Baja California, Mexico. We offer the finest services in hotel accommodations, massage, hair salon, facials, manicures, pedicures, waxing, and more. Our goal is to give you the best hotel and spa services at the best possible prices, while making your visit a healthy and pleasurable one! Weather it is a relaxing massage for one, or a complete Day Spa group package, you will find it at White Sand Massage Hotel, Hair Salon, & Day Spa. Please click on the above links for more information and photos of our service. Todos Santos is a short 45 minute drive from downtown Cabo San Lucas and about the same distance from La Paz, the capital city of Baja California Sur. With the recently finished new 4-lane highway, traveling to Todos Santos has never been so easy. Todos Santos is the only designated Pueblo Magico (magic city) in Baja California because of it’s natural beauty and enchantment. Home of the Hotel California, made famous by the Eagles Song, Todos Santos is made up of a combination of local Mexican people, as well as a high population of U.S. and Canadian artists, farmers, and surfers. Warm weather, beautiful white sand beaches, and a friendly, tranquil ambience has made this town a popular tourist destination, as well as home to many ex-pats.